I hope you've had a great September. On a non-ministry note, my sister-in-law is pregnant, and I'm so excited! This will be the first baby in one of Laurence and I's immediate families, and everyone is brimming with excitement. This past weekend she revealed the gender, and it's going to be a baby girl! I also just wanted to ask for prayer for a safe pregnancy. What's been going on in FOCUS has been just as exciting. 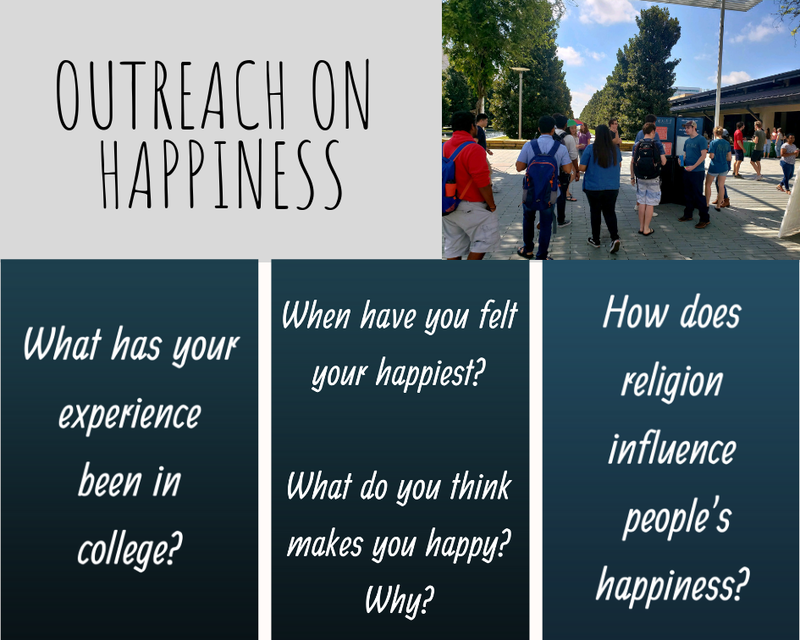 Last week we set up display boards on campus and asked passing people to engage in conversation with us. Our display boards had a few questions on them and quotes, and we just asked students to respond. I have some pictures below of what we asked and a photo of the displays. You'll see we were/are asking about happiness, and we decided to do a display on this because of a Princeton Review Top 20 list. The list rated the Top 20 school that had the least happy students, and the University of Texas at Dallas rated fourth!!! Our staff were just shocked by how highly we had rated, and we wanted to go out on campus and talk to people about their experience. The conversations went really well, and it seemed like most people were open to discussing happiness and their thoughts on how religion influenced it. 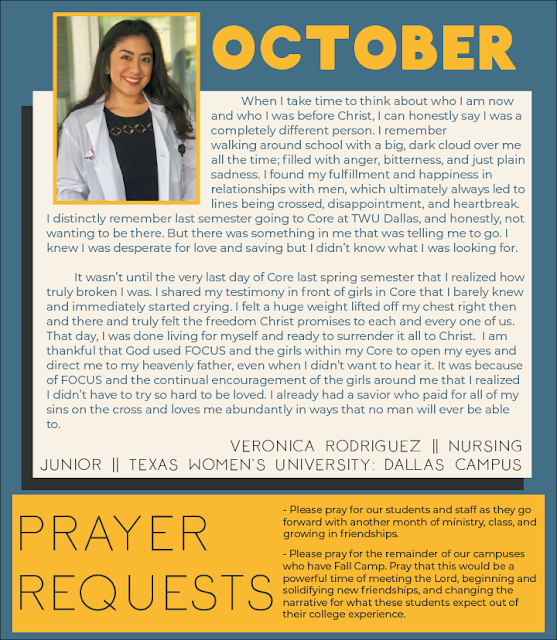 We'll be doing these same displays next week, so it would be awesome if you could be praying that God use this to impact our campus for Him. In September we also had our Fall Camp. I just wanted to share how great the camp went! One reason we do Fall Camp is to give an opportunity for more bonding. There are chunks of free time and discussion sections, so the cores end up getting several hours of bonding time. We see every year that having that time helps cores feel more comfortable and vulnerable with each other. 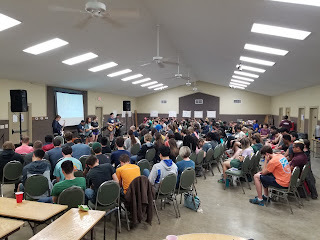 Our theme of camp was around community, and we had students sharing throughout the camp about their experiences with community. We had people share about how community has ministered to them, and also the costs that can come with being involved in community. The student sharing was so powerful. 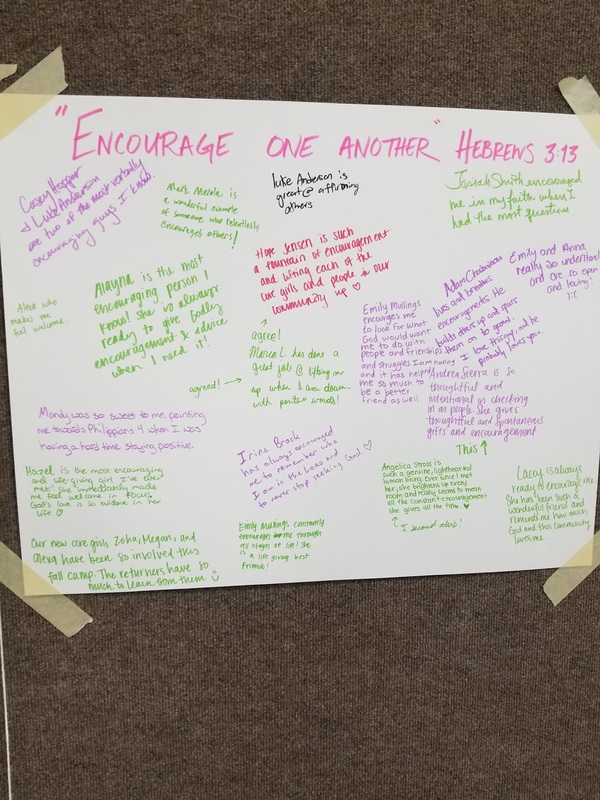 We also had posters around the room with one another passages from the Bible, and the students were encouraged to go write someone they've seen practice that passage. 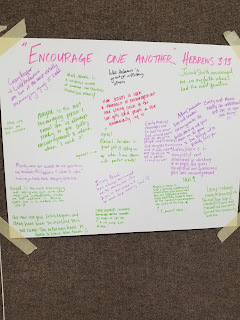 It was so encouraging all the things and names that people wrote on the posters! It was just so neat getting to hear stories of how people have been impacted by community and see our community encouraging one another. This was probably my favorite Fall Camp! Thanks for praying for our ministry and for investing in what is happening on these campuses. I wish I had time to tell you all the cool things that are happening this year, and I know that none of these things would happening with out your faithfulness. Let me know if there is anything I can be praying for you about! As always I'm going to end with a student testimony.